Kyle Erickson (ed.). 2018. The Seleukid Empire, 281–222 BC. War within the family. Swansea: Classical Press of Wales. The Seleukids, the easternmost of the Greekspeaking dynasties which succeeded Alexander the Great, were long portrayed by historians as inherently weak and doomed to decline after the passing of their remarkable first king, Seleukos (died 281 BC). And yet they succeeded in ruling much of the Near and Middle East for over two centuries, overcoming problems of a multi-ethnic empire. Erskine, Andrew, Lloyd Llewellyn-Jones & Shane Wallace (eds.). 2017. The Hellenistic court: Monarchic power and elite society from Alexander to Cleopatra. Classical Press of Wales. Hellenistic courts were centres of monarchic power, social prestige and high culture in the kingdoms that emerged after the death of Alexander. They were places of refinement, learning and luxury, and also of corruption, rivalry and murder. Surrounded by courtiers of varying loyalty, Hellenistic royal families played roles in a theatre of spectacle and ceremony. Architecture, art, ritual and scholarship were deployed to defend the existence of their dynasties. The present volume, from a team of international experts, examines royal methods and ideologies. It treats the courts of the Ptolemies, Seleucids, Attalids, Antigonids and of lesser dynasties. It also explores the influence, on Greek-speaking courts, of non- Greek culture, of Achaemenid and other Near Eastern royal institutions. It studies the careers of courtesans, concubines and ‘friends’ of royalty, and the intellectual, ceremonial, and artistic world of the Greek monarchies. The work demonstrates the complexity and motivations of Hellenistic royal civilisation, of courts which governed the transmission of Greek culture to the wider Mediterranean world – and to later ages. Strootman, Rolf. 2018. Seleucid Research Bibliography 1870-2017. Collins, John & J.G. Manning. 2016. Revolt and Resistance in the Ancient Classical World and the Near East: In the Crucible of Empire. Leiden: Brill. Engels, David. 2017. Benefactors, Kings, Rulers. Studies on the Seleukid Empire between East and West (Studia Hellenistica 57). Leuven: Peeters. The present volume contains a series of critical studies devoted to the political, institutional and ideological construction of the Seleukid empire, with particular focus on the complex interplay between the Seleukids’ Graeco-Macedonian background and their Achaimenid heritage. In order to explore to what extent the Seleukids can be considered heirs to the Achaimenids and precursors of the Parthians, and to what extent they simply ‘imported’ cultural and political behavioural patterns developed in Greece and Macedonia, the studies collected here adopt a decidedly interdisciplinary and diachronic approach. They investigate diverse fields, including the construction of the Seleukid royal court; the title of ‘Great King’; the prosopography of early Seleukid Iran; the integration of the ‘Upper Satrapies’ into the new Seleukid empire; the continued importance of the Iranian religions under the early Seleukids; the reign of the Persian Frataraka; the ‘feudalisation’ of the Seleukid empire under Antiochos III; the construction of a Hellenistic gymnasion in Seleukid Jerusalem; the importance of the Seleukid kingdom as a model for Eunous’ Sicilian slave-state; the evolution of the Syrian civic elite; and the potential influence of Seleukos’ royal propaganda on the religious self-legitimation of Augustus. Finally, a general comparison is proposed between the Seleukid empire and 19th century European colonialism. Pirngruber, Reinhard. 2017. The economy of late Achaemenid and Seleucid Babylonia. Cambridge University Press. 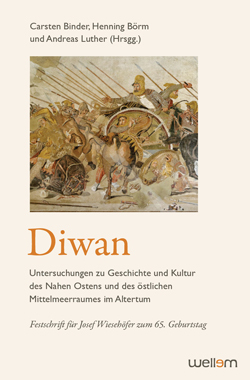 In this book Reinhard Pirngruber provides a full reassessment of the economic structures and market performance in Late Achaemenid and Seleucid Babylonia. His approach is informed by the theoretical insights of New Institutional Economics and draws heavily on archival cuneiform documents as well as providing the first exhaustive contextualisation of the price data contained in the Babylonian Astronomical Diaries. Historical information gleaned from the accounts of both Babylonian scholars and Greek authors shows the impact of imperial politics on prices in form of exogenous shocks affecting supply and demand. Attention is also paid to the amount of money in circulation. Moreover, the use of regression analysis in modelling historical events breaks new ground in Ancient Near Eastern Studies and gives new impetus to the use of modern economic theory. The book explains the theoretical and statistical methods used so that it is accessible to the full range of historians. Matthew P. Canepa. 2014. Seleukid sacred architecture, royal cult and the transformation of Iranian culture in the Middle Iranian period. Iranian Studies 48(1). 1-27. This article proposes a new approach to three of the most persistent problems in the study of Iranian art and religion from the coming of Alexander to the fall of the Sasanians: the development of Iranian sacred architecture, the legacy of the Achaemenids, and the development of the art and ritual of Iranian kingship after Alexander. Canepa explores the ways in which the Seleukids contributed basic and enduring elements of Iranian religious and royal culture that lasted throughout late antiquity. Beyond stressing simple continuities or breaks with the Babylonian, Achaemenid or Macedonian traditions, this article argues that the Seleukids selectively integrated a variety of cultural, architectural and religious traditions to forge what became the architectural vocabularies and religious expressions of the Middle Iranian era.